Kyle Rau's face-first dive and poke at the puck, a desperate and successful attempt to end the longest championship game in state tournament history, forever will be etched in state tournament lore. Rau's goal, scored while sliding on his belly, gave Eden Prairie a 3-2 triumph over Duluth East in the first triple-overtime championship game in the state tournament's 67-year history. The play capped a magical state tournament run for Rau, a 5-foot-9, 160-pound senior who scored two goals in each of the Eagles' previous two games and shared the tournament scoring title (championship games only) with seven points. A junior defenseman who was an all-state tournament selection last year, Kohlquist had a rousing start to this year’s tourney by unloading a stunning 13 shots on goal, one less than Alexandria’s team total. Most of Kohlquist's shots were low cannon blasts that led to rebound opportunities. He also had one assist and two quality hits while playing his usual hard-edged defensive game. Just a sophomore, Johnson plays with a grace and poise that belie his age. The son of former UMD star Dave Johnson, Adam was at the center of most of the Bluejackets' scoring chances, including the game-winning goal at 7:56 of the first period -- a goal scored from the seat of his pants. Johnson broke down the right side and was taken to the ice by the Lourdes' defenseman, but he still managed to shove the puck past goalie Nick Heimer. A senior forward, Reid had two goals and two assists to bump his season point total to 60 (24 goals, 36 assists). Reid had three of his points in the first period, when the Cadets erupted for seven goals. Number 66 never looked so good. Trailing 4-2 entering the third period, Crosson scored twice for the Prowlers to bring them back into a tie. His short-handed tally at the 3:50 mark brought the Thief River Falls bench -- and the crowd -- to its feet and provided the momentum for the team's rally. The senior goaltender flashed the form that helped Edina win last year’s Class 2A title, and his stellar play will probably give Blaine star Jonny Brodzinski nightmares. Girard finished with 17 saves, a modest total, but more than half of those were of the Grade A variety, especially the eight in the third period when the pressure was dialed up. The big stage didn’t seem to affect the Eagles senior much, as he scored twice, drew a penalty and was buzzing around the Lakeville North goal much of the night. Yaaaawn. Just a typical game for the Mr. Hockey finalist and Gophers recruit. The sophomore forward hadn’t scored a goal since early February, so you could say it was highly unlikely that he would be the one to vault the Greyhounds past Edina in overtime. Or you could say he was due. Toscano’s goal 3:54 into the extra period was his fourth of the season. The second-line winger played the game of his career and then some, scoring twice and adding an assist. Commers’ goal on a shorthanded breakaway with 26 seconds left in the first period gave the Cadets life after a rough start had them facing the possibility of going into the first intermission traiing 3-0. When storybook endings are written, they don't end any better than this. Rau, who returned for his senior season to win another state title with his Eden Prairie classmates, did just that. He scored the game-winner in triple overtime against Duluth East, diving headfirst to knock in a loose puck that had trickled behind goalie JoJo Jeanetta. 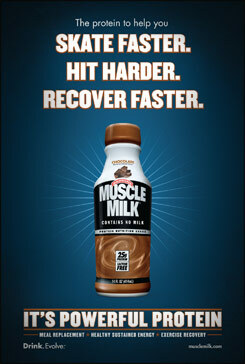 The Muscle Milk Player of the Tournament Award goes to the most outstanding participant in the 2011 Boys State High School Hockey Tournament. 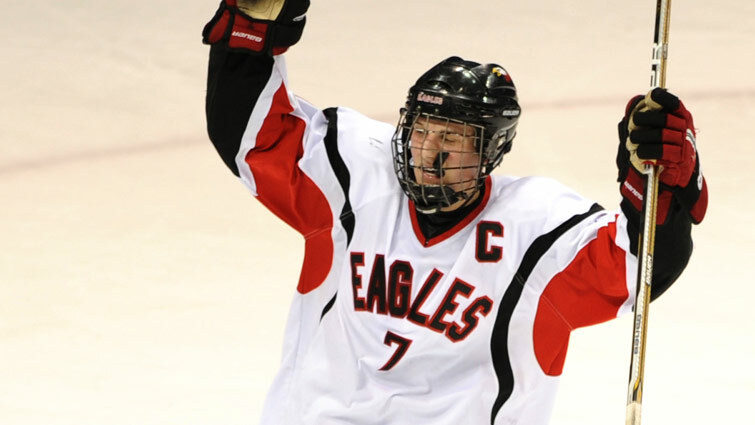 This player best exemplifies the qualities of Minnesota High School Hockey at its highest level demonstrating skill, determination, teamwork and sportsmanship. Voting for the award ended on Monday, March 14th at noon.